Pictopix is now live on Steam Store! You can also keep up to date with news about Pictopix on Twitter and Facebook[www.facebook.com]. Thanks again for supporting Pictopix on Greenlight. I hope you will have a lot fun at the release date! Happy Holidays and see you very soon! Pictopix has a release date! 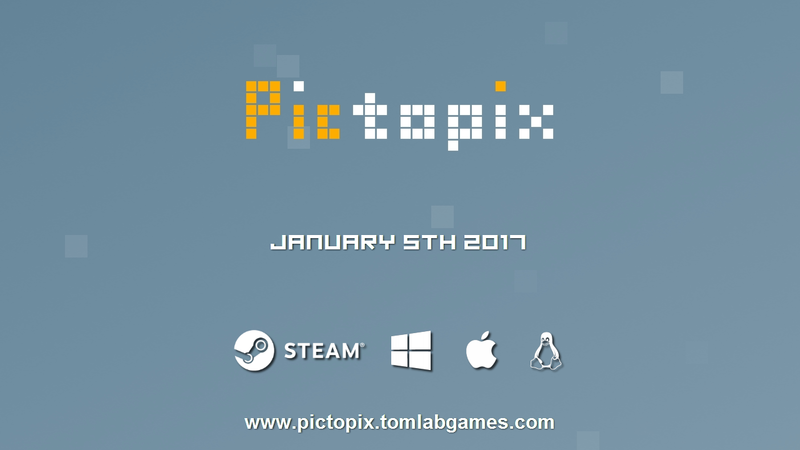 Pictopix has a release date! The game will be revealed tomorrow on the Steam store. Pictopix is a puzzle game where you use logic to color squares on grids in order to reveal pictures. Easy to learn and very addictive, the game starts with small grids and ends with big grids. With over 150 colored puzzles, a shuffle mode and a puzzle editor, Pictopix will bring you hours of fun ! 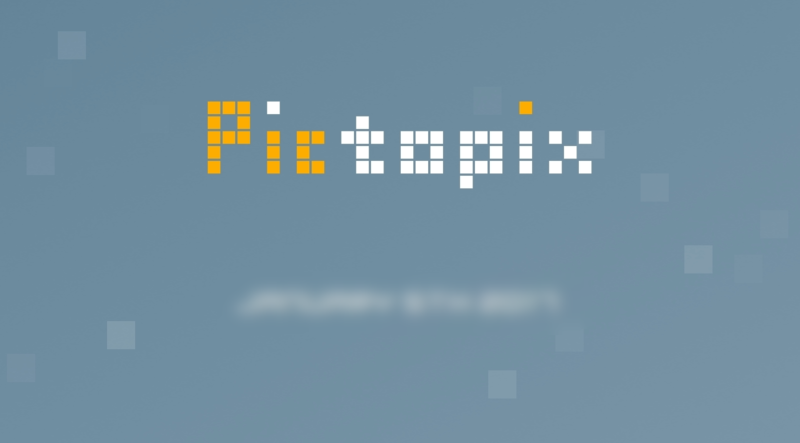 You've never played a game like Pictopix? It's easy! Look at these numbers on top and on the left of the grid. They help you to find which squares have to be filled in. When the right squares are filled, a nice picture is revealed. For beginners, there are hints to help you solve the puzzles. Columns and rows with blue numbers indicate to you that at least one square can be filled in or marked with a cross (a cross means you are sure that the square has to be empty). Advanced players can disable these features in the settings to get more challenges (and to earn achievements!). One of the big features of Pictopix is the possibility of creating and sharing your puzzles with other players. As you can see in the image below, the game includes an easy to use editor . There is a layer to draw the picture that will be revealed when the puzzle is solved and another layer to draw the squares to fill in. Once your puzzle created, the editor will tell you if it can be solved logically (without guessing). The Pictopix puzzles have been created with it ! The puzzle editor is present in the demo version of Pictopix (see below to download it). In the final version of Pictopix, you will be able to share your creations with Steam Workshop. Download a demo of Pictopix on the website ! (click here[pictopix.tomlabgames.com]) The demo contains 15 puzzles (from 5x5 size to 25x25). The Shuffle mode is available and you can create puzzles with the editor. Don't hesitate to give your feedback, so the game will be improved. The release date depends on player's feedback and some Steam elements like achievements, Cloud save and workshop have to be integrated. So the the release is planned in late 2016. For the release, Pictopix will be on Windows and Mac. The next platform will be Linux. And according to the success of the game, others platforms will be taken into account. You can follow Pictopix on Facebook[www.facebook.com], Twitter, Tumblr[pictopix.tumblr.com] or IndieDB. I once created a game like this, that produces random generated puzzles, so that infinity puzzles are available, bad it had not such a nice looking gui like urs . Will your game contain that feature aswell, or just these 150 maps + own maps? Hi everyone, if you want to get the latest news, don't forget to click on the "Follow" button (below the video). Pictopix has just been greenlit! Thank you so much everyone for your support. I'll make an announcement shortly. I voted yes because I'm always up for games like Picross. I do love a good nonogram puzzle, shout out to the dev that brought this to my attention, immediate upvote. Pictopix has been Greenlit and is now listed in the Steam store. For the latest information, purchase options, and discussions for Pictopix, please see it on the Steam Store or in the Steam Community.